Last weekend Mama outsourced finding us somewhere to hang out to Papa, who came up with the photography exhibition translatable as Undisturbed Russia, Pristine Russia, Natural Russia, or (the official tag) Primordial Russia. Mama was a bit dubious about the last phrasing and even more dubious that we might find such an outing worth the trek into town. However, since she didn’t have the personal fortitude necessary for something as child-pleasing as an indoor play area, and since we have already written about such indisputably fabulous venues such as the Moscow Zoo on the blog, she thought we would give it a whirl. Partly because the exhibition is in the Central House of Artists. Mama has fond memories of the Central House of Artists. It used to be a place where you could not only nosy round the workspaces of any number of hard at work craftsmen but also turn a corner and unexpectedly trip over an installation of millions of tiny paper gingerbread men. These days it serves as an exhibition space along the lines of Earl’s Court or Olympia in London and has been hosting first a conference of estate agents and then the Russian equivalent of a Crufts for cats the last couple of times Mama has been wandering past. Somehow we didn’t quite make it inside. It was clearly time to remedy this. Plus, the Central House of Artists is also opposite Gorky Park, in the same building as the New Treatyakov Gallery and in the middle of the sculpture park Muzeon. If we really didn’t like Undisturbed Russia, Mama reasoned, there were numerous options for escape. As it turned out, she needn’t have worried about my Easily Pleased Big Brother’s happiness with the entertainment. ‘This is much more interesting than I thought it would be,’ was his verdict as soon as it was evident that those parts of Russia that are Undisturbed are covered with photogenic animals, which was very quickly indeed. Who hasn’t heard of Timur the goat and Amur the tiger by now? What followed was a thousand hours of me and Mama trying to keep up as he bounded from one picture to the next with the clear intention of photographing every single one of the bears, the seals, the bears, the walruses, the ladybirds, the bears, the tigers, the foxes, the squirrels, the bears, the whales, the lizards, the bears, the frogs, the butterflies, the bears, the bears and the bears (there were a lot of bears). My camera, on the other hand, turned out to be too full of pictures of Papa’s ear to allow me to follow my whimsy in this way and thus I was initially considerably more disgruntled about the whole experience, which, it turns out, was large. Do not be fooled by the fact that the first few taster pictures are in the foyer next to the cloakroom (Mama was, for a moment), or taken in by that the first display space proper is skirtable in about five minutes if you tow Mama about really determinedly (I was at first). You will pass from there to a massive room, with even more spaces leading off it, and there will be many many lots of photos and quite a few people. The Central House of Artists, unlike the Tardis, is just as big on the inside as it looks from the outside and the giant exhibition didn’t even begin to fill all its available area. If you get bored (you won’t get bored) you can always have a look round some of the other galleries. It is just as large as it looks on the inside. Back in Undisturbed Russia, there’s room for a stage and everything. We sat down quite hopefully in front of it, but it mostly seemed to be for showing films about how you can remove rubbish from Lake Baikal by doing yoga. So I went back to grumping my way past the glories of nature and my Easily Pleased Big Brother went back to standing earnestly behind his camera in front of a photo of bears. But then we found the children’s crafting area which, in the best Russian tradition, was full of opportunities to get covered with goop! We bounded happily over and from a choice of clay modelling, sand collage creation and spooning gobbets of paint into frames and smearing it around to make animals, we chose the messiest. To be fair, the aprons this time were particularly well designed and only Mama ended up with paint in her hair. Despite this, we thoroughly enjoyed ourselves. After this lengthy interlude, my good mood was quite restored and I was actually able to take an interest in posing cutely in front of all sorts of backdrops, which was how Mama snuck in her quota of landscape appreciation amidst the distractions offered by mammals, reptiles and fish. Russia, it turns out, is not only very very very very very very very big but also wildly varied in terrain (and fauna), and you can admire some utterly stunning pictures of everything from active volcanoes through trackless forests in all sorts of weathers and seasons over bodies of water both large, small and colourful to the northern lights. It’s bloody impressive (says Mama) even when you aren’t dealing with shots taken by people who definitely know which way of a camera is up. It’s pretty but it’s also coooooooool. Running through it all is the Volga river, which gets a whole room where you can lie and float virtually along it as a film plays on the walls and ceiling around you. Except we were too busy scoffing croissants and eclairs while Mama revived herself with coffee in one of the pop up cafes, and watching urbanite Muscovites being entranced in the nearby cinema room by how the most exciting thing to happen in your average Russian village is a tragic swan love story ( <spoiler> the male swan gets electrocuted at the end </spoiler> ). There was folk singing, moody fishing shots and farmers leaning on gardening implements sucking cigarettes contemplatively and everything. Mama was delighted. Basically it’s a great exhibition for anyone who likes large professionally breathtaking nature photography, friendly environmental films and small scale amateur crafting, which is surely everybody. The exhibition runs until 25th February, so still time to get in there and enjoy. The Central House of Artist’s website. This is what the Hitchhiker’s Guide to the Galaxy has to say about sunsets and why we see the colours- a photographer’s view. Opening: Until 25th February 2016, 10 or 11 am to 8 or 9pm. Admission: Adults: 350 roubles (£3.50), children under 10: free, concessions: 150 roubles (£1.50). By Metro: Oktabrskaya (orange and brown lines) – turn left, cross over the massive seven million lane highway and head left down the other massive seven million lane highway at right angles. Park Kultury (red line) – turn right, cross over the Moscow river, cross the seven million lane highway. The Central House of Artists is opposite Gorky Park. By other means: Actually, the trollybus route ‘Б’ stops right outside. This is a circular route, which takes you round the edges of the centre of Moscow and hits a fair number of metro stations on the way. It’s quite a fun way of getting to or from the Central House of Artists. One of the things about growing up is that you start to find a use for all the seemingly pointless things the grownups are always trying to teach you. Take reading for example. I am sure that my Fantastic Big Brother has for some time thought that learning to read (in two languages) was something sent purely to torture him, personally, on an epic scale. Which in the case of the total lack of a sound spelling relationship in English is probably true. I’m looking forward to that experience I can tell you! However, my Fantastic Big Brother has also just started to realise that if he uses his new text decoding powers, he can understand the secret messages adults send to each other. One of which was a huge sign outside the Natural History Museum advertising an upcoming Sensational Butterflies exhibition, to consist of a biggish tent hosting hundreds of live butterflies, a number of plants and lots of people gawping at both. Ever since he spotted this we’ve been bugging Mama to take us and it was agony, agony I tell you, to walk past the site week on week and realise it wasn’t… quite… finished. And then it was!!! But we were on holiday. And then it was Russian Orthodox Easter! And then there was a concert and a picnic we had to attend! But finally, FINALLY we got to go. Was it worth the wait? I hear you cry. YES! Yes, a thousand times YES! Now contrary to what you might be expecting, the air was not thick with the beating of tiny wings when we got inside. 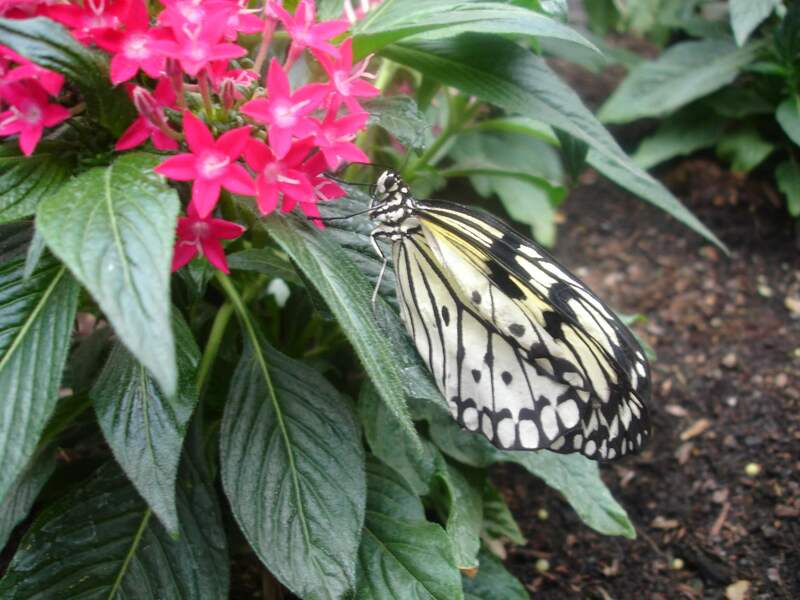 The butterflies prefer, in the main, to lounge around picturesquely on the rather brightly coloured flowers and foliage inside. Which is just fine. Great photo opportunities abound, and for those of us unburdened by cameras, it is a lot of fun hunting around for butterflies with new colours or new shapes in amongst the leaves. 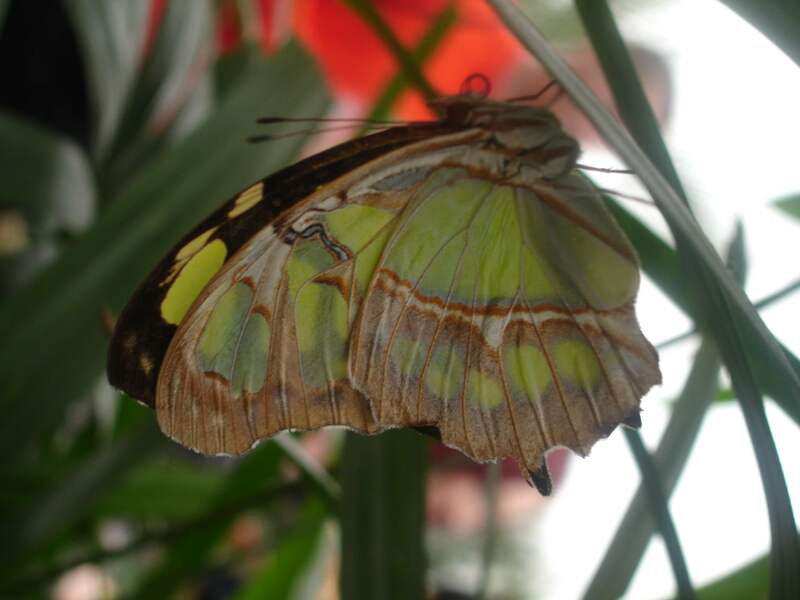 That said, it turns out to be surprisingly hard to avoid the butterflies at Sensational Butterflies when they do start to move about. The big blue ones in particular sure liked settling on our shoulders, bags, legs, backs, arms and, much to my Fantastic Big Brother’s delight, his hand. Mama really recommends feeding your kids jammy scones just before you go in for the maximum interactive experience, but in truth you don’t really need to try for it. You are just a big walking flower to these things. 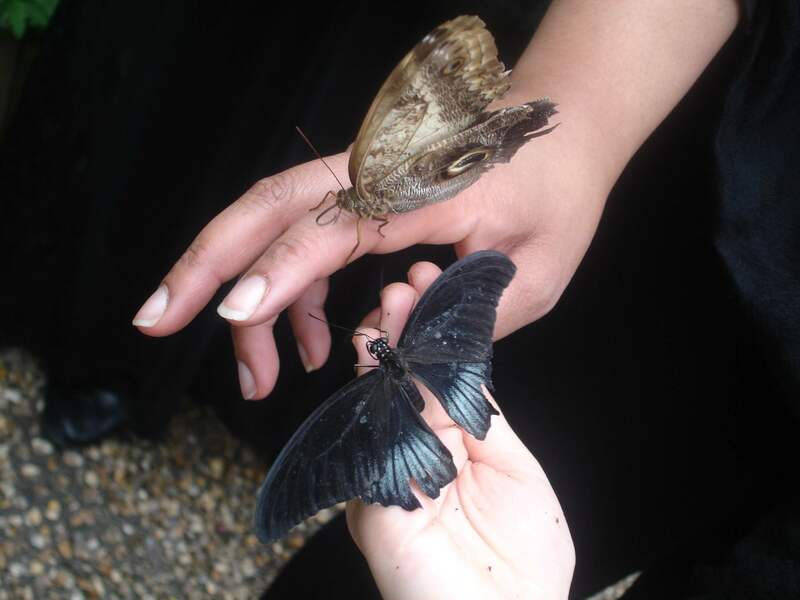 Unfortunately for the butterflies who land on the visitors, they are absolutely irresistible to touch, the large numbers of signs reminding you not to and the large numbers of guardians on hand to shake their heads at you when you do notwithstanding. And that’s just the adults. 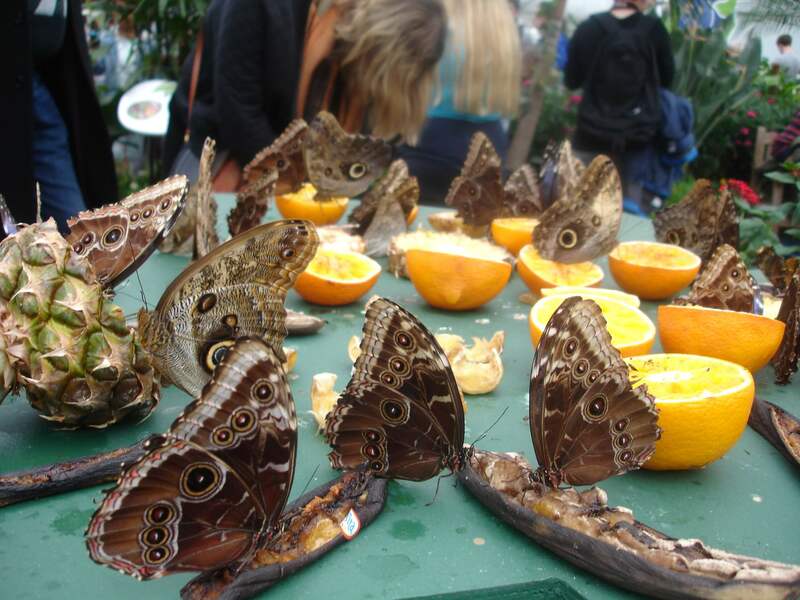 Sensational Butterflies, basically, is not for the very squeamish about animal exploitation, as there is some collateral damage on busy days such as the weekend we went, even if you are scrupulous about keeping your hands to yourself. I trod on one, for example. I didn’t mean to! It landed right behind me just as I was stepping backwards! Mama assured me that the bent wing would grow back ok, but I am not so sure. Be careful in there people! It’s also very hot and humid. If you can stand the anticipation, Mama thinks it might be worth waiting until the weather outside more closely resembles the weather inside. But that’s just because she ended up carrying three sets of coats and jumpers. Even stripped down, we stayed so long that I began to wilt quite alarmingly and my Fantastic Big Brother had gone as pink and sweaty as he does in the hottest days of summer. Take plenty of water, Mama advises and probably an hour inside is pushing it. Although I’m not sure who else other than my Fantastic Big Brother would insist on staying at Sensational Butterflies long enough to go round the tent four or five times just in case there was one type of butterfly hiding in the flora we hadn’t spotted yet. Most people seemed content to wend their way from one end to the other once, if once fairly slowly. And I could probably have lived with just the one repeat circuit, to be honest. The things I do for my Fantastic Big Brother. There is some attempt at making the experience educational, with some large Q&A boards with what would have been interesting questions if the butterflies weren’t quite so enthralling, and a ink stamping trail. 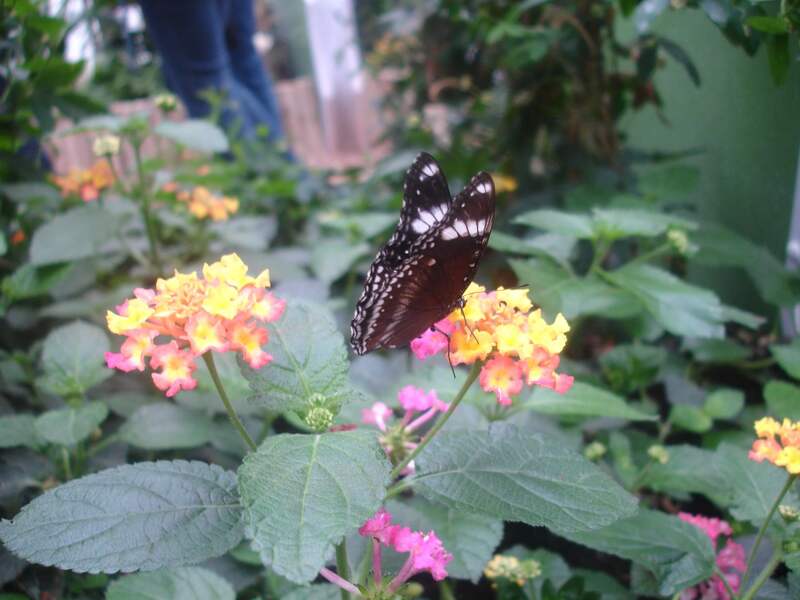 But we thought they were superfluous as entertainment, because the butterflies are quite fabulous enough on their own. Well, the butterflies, and their chrysalis house. The variety of little butterfly casings are pretty cool in and of themselves, but of course, the excitement is in watching them break out of their cocoons. 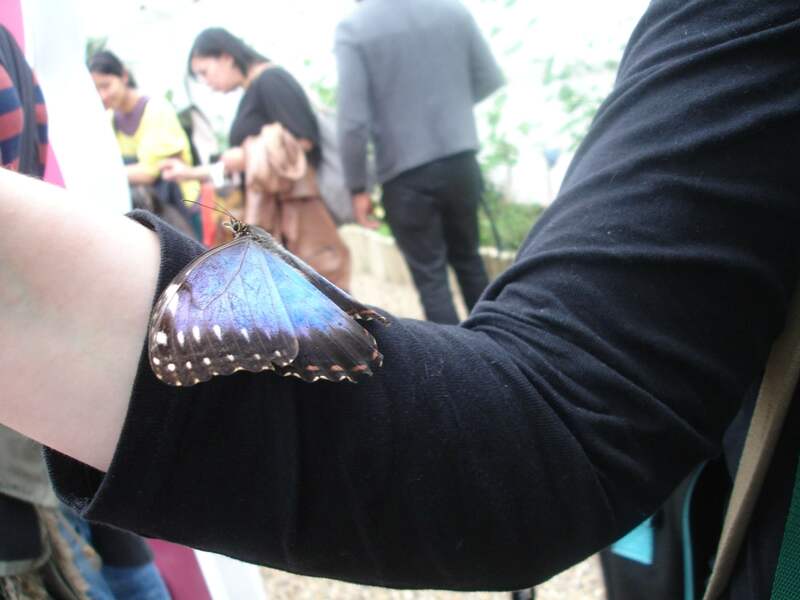 We were even there when they brought some new butterflies out! Cooooooool. 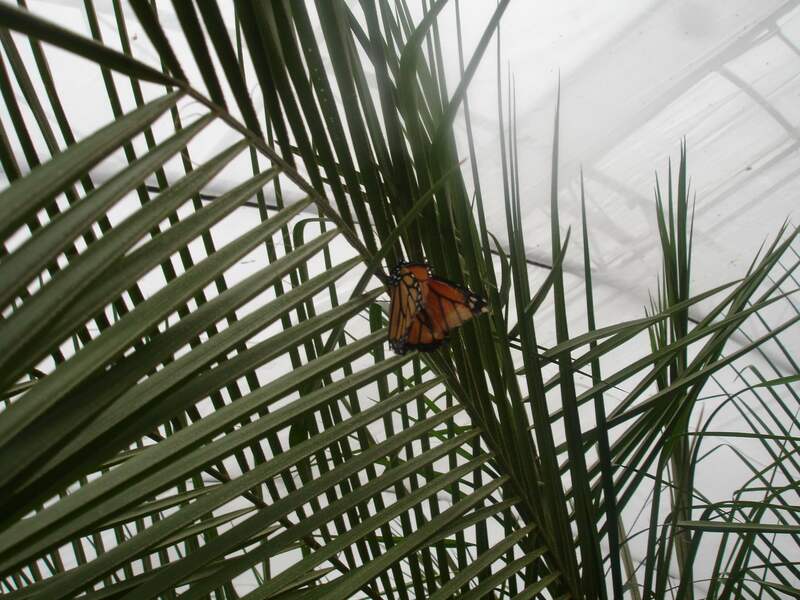 New varieties to admire while they finish drying their wings into hardness! And then, of course, there was the strategically placed caterpillar. With added poo! Mama thought they were eggs! Hahahaha! Pffff. Mama. My Fantastic Big Brother has a game called Plop Trumps and so is now an expert in poo. Silly her. On exiting you will find yourself in the shop. This is an excellent arrangement. I highly recommend sauna-like conditions for weakening parental resolve when it comes to toy buying. I got a plastic pink butterfly and my Fantastic Big Brother, a tarantula. Not a real one, but that doesn’t stop him from trying to leap it out at Mama at every opportunity. He has even tried hiding it in her bed at night. Cute, huh? Anyway. 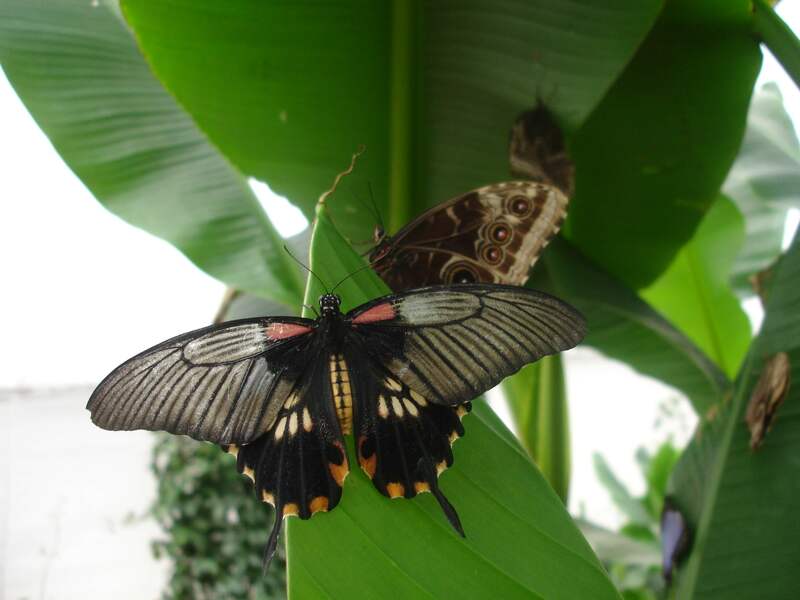 Sensational Butterflies is an excellent addition to the entertainment offered by the Kensington Museums, which is why it’s on its seventh summer appearance presumably. Take a good close up camera, someone who hates butterflies to hold the coats outside and your warm weather stamina and you’ll be golden. And covered in butterflies. 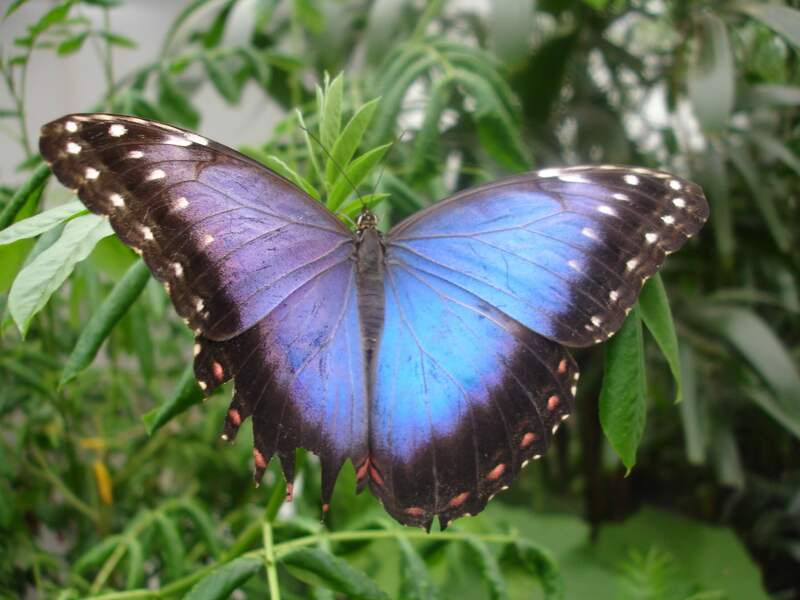 The Sensational Butterflies page on the Natural History Museum’s website. This is what the Hitchhiker’s Guide to the Galaxy has to say about butterflies (with excellent butterfly quotes). Opening: 10.00 – 18.00 every day until September 13th 2015 (and probably next summer too). By tube: South Kensington (District, Circle and Piccadilly lines). 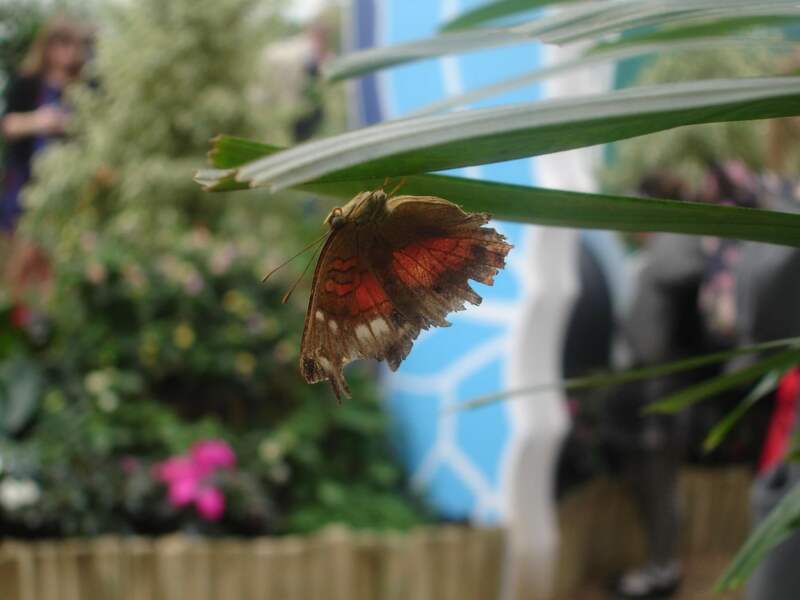 There is a subway walk that runs directly from the station to Exhibition Road, and you can pop out just outside the Sensational Butterflies tent. By bus: The 360 stops on Exhibition Road just up the road. The 14, 49, 70, 74, 345, 414, 430 and C1 stop at South Kensington tube station. The 9, 10, 52, 452 and 70 stop at the Royal Albert Hall (ten minutes away).